If you would like to donate: We will be collecting gently used clothes of all sizes during normal business hours starting on April 14th and ending on April 28th. 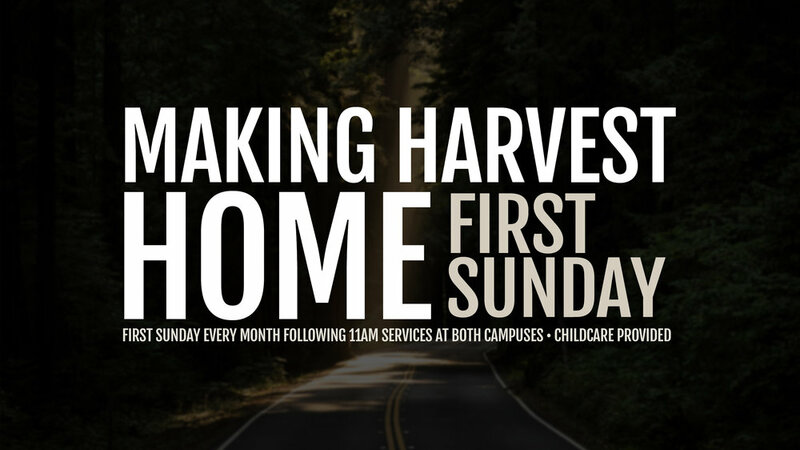 If you are interested in finding out more about Harvest, would like to meet our pastors, or simply wish to hear about the ministries we are passionate about, join us at our next "Making Harvest Home" event, held in the small group room at both campuses immediately following the 11:00am service on the first Sunday of every month. Childcare will be provided for K and under. We will see you there! We are calling all of you to join us at our Spring Lake Campus on Sunday, May 19th at 8 p.m. for a night of worship and time in the Word. These nights are extremely important because we are serious about encountering God in all His glory. The only way to see improvement in the horizontal matters of life (like our marriages, our families, our work, our friendships) is to get VERTICAL - to experience God in all his glory and be transformed by the power of Jesus. 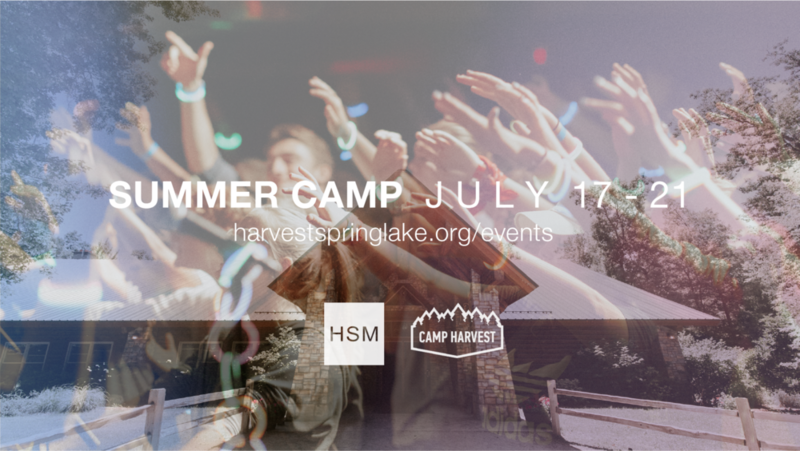 Experience the best week of the summer… come to Summer Camp and have a life changing encounter with God. It’s amazing how much growth can happen in one week in a high school student’s relationship with Christ and with others. These days are filled with opportunities to engage in worship, lean into teaching from God’s Word, get honest and transparent in small group and enjoy the outdoors through a variety of unique camp activities. Total amount you can contribute towards the camp sessions for your child/children. If there is more than one child, combine the amount you can contribute into one sum. Cost is $340 per student. A 40% discount will be applied making the cost $210 per student. Join us this Easter as we celebrate the day the chains of sin were broken, shame was swallowed up in victory, and our Savior, Jesus Christ, rose from the grave - forever sealing our freedom. Join us for our Good Friday Walkthrough Experience as we remember the sacrifice and death of our savior Jesus Christ in a unique way. Trading our shame for His perfection, He broke our chains of sin and brought us freedom by His blood. The Walkthrough Experience will be held at our Grand Haven Campus from 4:00pm-8:00pm. Join us at both campuses the weekend of February 23-24 for our next “All In” weekend – a special weekend where we examine the things that are core to our beliefs at Harvest. This weekend we will be diving into the idea of “Obedience” and how as followers of Jesus we are called to be all in on obedience to Christ. You won’t want to miss this exciting weekend, we’ll see you there! We love baptisms at Harvest and would love to have you join us for our next baptism weekend where we'll get to hear story after story of the transformative power of Jesus in the lives of our congregation. READY TO GET BAPTIZED? SIMPLY SHOW UP!! If you're ready to take this exciting next step in your walk with Christ, we'd love to hear your story and have the privilege of baptizing you! For your convenience, we'll have everything you need on hand so there's no need to bring extra clothes, a towel, etc. Just show up ready to share the story of how Jesus has changed your life! One note – If you're a parent of a child 10 years old or younger and your child would like to get baptized, we ask that you contact the church office so we can meet with your child one-on-one just to make sure they understand the significance of baptism and the important role it plays in the life of a follower of Christ. To set up a meeting for your child or inquire more about baptism, simply fill out the form below and we'll be in touch. Thanks! If you're inquiring about your child, please let us know their name and age. Thanks! Thank you – we'll be in touch! Join us on February 22nd for a night of worship and prayer at our Spring Lake Campus. For directions to the campus, simply click the link below. For more detailed information and answers to FAQ’s, click the sign up link below! We love seeing so many new children around our church and rejoice with parents when they decide to publicly dedicate their young ones to Christ. We will be dedicating some of our newest little ones to the Lord in our services February 2nd & 3rd – If you would like to dedicate your baby on this weekend or have any questions, please fill out the form below and we'll be in touch! **Dedications will be happening at both campuses in every service. At which campus would you like to dedicate your child? During which service would you like to dedicate your child? Please include the name(s) of the child or children you'd like to dedicate as well as any questions you might have. It’s that time again ladies - we’re back and we invite you to join us for Ladies Bible Study! Continuing with our schedule from the fall, we offer two studies -- both meet in the Worship Center at our Spring Lake campus and start on Thursday, January 17th. On Thursday mornings, Kristen Wisen and Katherine Averill will continue their lecture-based study entitled “Champions + Kings” based on the life of David in 1st and 2nd Samuel. Childcare is provided. On Thursday evenings, Mary Wisen and Jody Flickema will continue their study on the letter of Ephesians. This study includes both a teaching time and a small group time. Please note childcare is not provided for our evening study. When we commit time to studying God’s Word with a desire to know Him more, He is always faithful to meet us there. No need to sign up… just come and join us on Thursdays and commit this year to drawing closer to God through the faithful study of His Word. Harvest Bible Chapel will be offering Dave Ramsey’s Financial Peace University Class starting Monday, January 14th, 2019! This course will teach you how to get rid of debt, manage your money, spend and save wisely, and much more. The class will meet in the Spring Lake campus café on Monday nights from 6:30-8:30pm and run for nine consecutive weeks, ending March 11th. To make the class more affordable, Harvest will be underwriting a portion of the cost, making it available to you for a reduced price of $55 per household! The class will be limited to the first 40 households that register and pay for the class. If you are interested in participating, you can sign up in the lobby at either the Spring Lake or Grand Haven campus. Join us on December 31st for the best NYE party. Righteous Cuisine, an Arcade, prizes, a coffee bar, and a whole lot more - it's all leading up to the best way you'll ever ring in the New Year. You're not going to want to miss this! If you are between the ages of 18-30, single, dating, engaged, married - it doesn't matter - we want you here! This is going to be an awesome night. Don't miss out! Join us this Christmas season in celebrating the incarnate Son of God, Jesus Christ - the true source of our peace, love, joy and hope. Our Christmas Eve services will be on December 24th at the Grand Haven Campus at both 5:00pm and 7:00pm. Childcare for birth Kindergarten and under will be available. Join us once again for our annual Vertical Women's Conference. Do you feel discouraged, even defeated, in your battle against habitual sin? Are you dismayed or surprised by the situations that bring out your fear, anger, or distress? In this year's Vertical Women Conference, trusted Bible teacher and counselor Elyse Fitzpatrick delves into the heart of the problem: deep down, we’re all idol-worshippers who put our loves, desires, and expectations in God’s place—and then suffer the consequences of our misplaced affections. Yet, God loves his people and can use even our messy lives and struggles for his glory! Come join Elyse Fitzpatrick at Harvest Grand Haven Campus as she shows us how to better search and know our hearts, long for our gracious Savior, and resist and crush our false gods. So often as parents we find ourselves just trying to survive the day, month or season with our children. God calls us to so much more! Join us for a two-day conference at our Grand Haven Campus (Friday, September 28th 7 p.m. - 9 p.m. | Saturday, September 29th 9 a.m. - 12 p.m.) aimed at helping parents understand the purpose of parenting in light of God’s Word. Starting with Scripture as our foundation, we will provide practical tools to help parents with children of all ages. Join us at 7:00pm on Wednesday, June 27th at our South Campus (directions) for a night of worship and prayer. You won't want to miss this evening to practice the way of Jesus by taking time out of our busy lives to spend some moments in His presence as a church body – we'll see you there! Join Harvest 20's for a night of worship, as we lift high the name of Jesus, the one who revives the heart! as in a dry and weary land where there is no water." We are getting ready for our upcoming Easter choir! This event is open to anyone who wants to join and participate in the choir. Take a look at the upcoming practice times and other important details. For questions and to sign up click the link below. We're so excited for our Middle School WINTERFEST this coming February! This time away will be an amazing opportunity for students to focus on building relationships with other students, enjoying the break from the distractions of everyday life, and most importantly developing their own personal relationship with Jesus Christ. We hope your student will be there to join us! Sign up today! The early bird cost is $80 through December 31st, then the price will increase to $100. You are not going to miss this incredibly powerful night of worship so mark your calendars for Wednesday, January 24th at 7pm to 8pm! All 20’s are invited, so bring a friend! We will be offering Dave Ramsey’s Financial Peace University Class starting January 9th, 2018. This course will teach you how to get rid of debt, manage your money, spend and save wisely, and much more. The class will meet in the North Campus Café on Tuesday nights from 6:30pm-8:30pm and run for nine consecutive weeks, ending March 6th. To make the class more affordable, Harvest will be underwriting a portion of the cost, making it available to you for a reduced price of $55 per household! The class will be limited to the first 50 households that register and pay for the class. For more information, please contact Jody using the form below. Thanks! It's getting harder. The tide never seems to stop rising. are the primary currency of the jungle we are fighting our way through. Only when I meet Him fully and totally do I have any chance of standing strong in these waves. 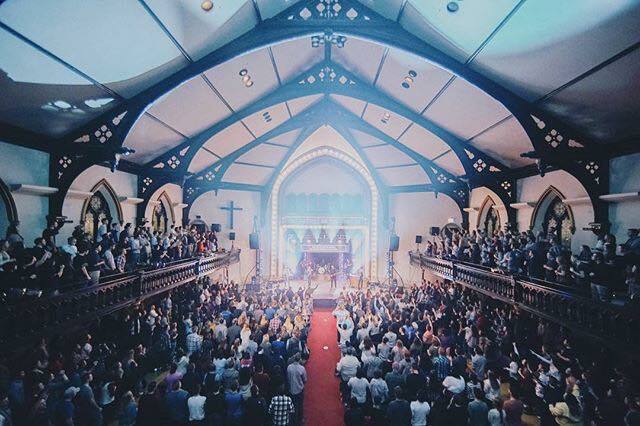 Harvest 20’s Ministry is heading to Chicago for three days of worship, and teaching with hundred of other young adults from around the Mid-West. Will you join us? You were made for more! **we have already reserved tickets for our 20s group. please contact us directly using the registration details link above to inquire about tickets! Our Christmas Services this year are December 23rd & 24th. Service times will follow our usual schedule with a 5pm Saturday service at our North Campus and 9am and 11am Sunday services at both North and South Campuses. held at our new South Campus in Grand Haven! We look forward to this day all year as we seek the Lord, lift high His name in worship, and have a sweet time of fellowship among our women. This year we are thrilled to have back CCM artist and worship leader MEREDITH ANDREWS. We also have Harvest Bible Chapel Rockford's pastor wife BETSEY DIRKSE who will bring God's word in a dynamic, powerful way that will challenge and encourage us. Register online via the link below, via mail (event postcard needed), or in HBCSL's foyer. If you're interested in hearing more about what the Bible teaches about the End Times, join us for a two-part class on Friday, October 6th from 7:00pm-9:00pm and Saturday, October 7th from 9:00am-12:00pm in the main sanctuary at our North Campus as Pastor Dave Wisen and his wife Kirsten teach through this topic. To sign up, visit our table in the lobby or email us using the form below. See you there!